The Australian government has approved the purchase of a further 58 Lockheed Martin F-35A Lightning IIs to allow the replacement of the RAAF’s fleet of F/A-18A/B ‘classic’ Hornets. 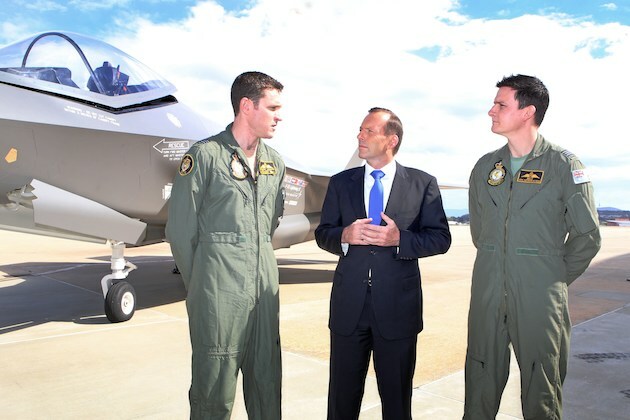 Prime Minister Tony Abbott made the formal announcement – which would take Australia’s F-35 acquisition to 72 jets, after a first batch of 14 F-35As was approved by the previous Labor government – in Canberra on Wednesday. The 58 additional jets will be acquired at a cost of $12.4 billion, a pricetag that includes $1.4 billion in facilities work at RAAF Bases Williamtown and Tindal, plus training, spare parts, weapons and support equipment. 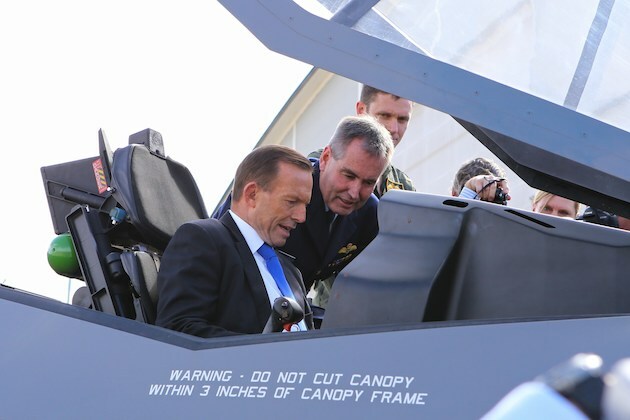 “Together with the Super Hornet and Growler electronic warfare aircraft, the F-35 will ensure Australia maintains a regional combat edge,” the Prime Minister said. The announcement also effectively ensures Australian industrial participation in the F-35 program worth over $1.5 billion, although the Prime Minister told media the acquisition was being made on the basis of “defence priorities” and not for the job creation and Australian industrial involvement that comes from Australia’s participation in the F-35 program. The government was understood to have received a cabinet submission from the ADF earlier this year with two options, one for the full 58 jets and the other for a split buy of 38 jets this year and 20 more in future years. The F-35s are being acquired under the DMO’s AIR 6000 Phase 2A/2B New Air Combat Capability (NACC) project. This decision follows a May 2012 two-year deferral of a Phase 2A/2B approval by the Gillard Labor government, ostensibly to “align” the RAAF’s planned initial operating capability (IOC) of 2020 with that of the US Air Force. The RAAF already has two F-35As in final production that were contracted under the program’s low rate initial production (LRIP) lot 6, and has also secured long-lead production items for a further 12 aircraft. The first two RAAF aircraft are scheduled to be delivered to the USAF’s integrated training center at Luke AFB in Arizona by the end of the this year, while the RAAF’s first two pilots will begin training on the F-35 in December this year and in April 2015. The 72 F-35As will replace the 71 classic Hornets of Williamtown’s 3 and 77SQNs and 2OCU, and RAAF Tindal’s 75SQN. IOC – initial operating capability – for Australia’s first F-35 squadron is planned for 2020, the current classic Hornet fleet will be withdrawn from service over 2021-22 and FOC – full operating capability – for the three operational squadrons and 2OCU with the F-35 is planned for 2023, the Prime Minister confirmed. A further Phase 2C tranche of the project for up to 28 F-35s was deferred back in 2012 for a decision in the early 2020s to replace the 24 F/A-18F Super Hornets of the Amberley-based 1 and 6SQNs, meaning for the foreseeable future from the early 2020s onwards the RAAF will operate an air combat fleet of 72 F-35As, 24 F/A-18F Super Hornets and 12 EA-18G Growlers. The Super Hornets were ordered in 2006 as a ‘bridging’ capability between the retirement of the General Dynamics F-111C in 2010 and the arrival of the F-35A, but ongoing delays to the JSF program means it is likely the Super Hornets will be retained for a full life-of-type of 20 or more years. I think you need to go back and ‘re read’ the article. The RAAF is not throwing away the Super Hornets as and when you suggest, the 72 F-35A’s are to replace the remaining 71 Classic Hornets which are all going to be 30+ years old by that time. If and when the decision is made to proceed with the 4th Squadron of F-35A’s at a later date, the Super Hornets will be 20 years old by the time they are replaced, eg, at around 2030. The 12, still to be delivered, Growlers will operate well past that time, and at a guess it might be prudent to keep some of the Super Hornets that were ‘pre-wired’ for conversion to Growlers as a source of spares or attrition replacements, it may also be useful to keep some airframes for ‘buddy’ tanking roles and possible as trainers for the Growler pilots too. Having said that, the fate (disposal) of the Super Hornets will also be tied to whatever agreement was made with the US at the time of purchase (the US places strict conditions on what happens to weapons systems once the original user finishes with them), I’ve heard suggestions that at the end of their service life with the RAAF they will be returned to the US. I believe that when the Super Hornets are at the end of their service life with the RAAF they will be returned to the US is correct – this was specified at the time of ordering. It wasn’t “specified” that they’d be returned at time of ordering, it was just part of the plan of taking on a bridging capability as it was then – it was hoped the USN might take them on. But now that it seems likely they Supers will lead a full and productive life in RAAF service, they will be disposed of at the end of their service the same way any other US-sourced combat aircraft will…hopefully NOT in a landfill! Okay thanks, I thought it was a contract requirement… that makes sense now that the Super Hornets have evolved into more than just a bridging air combat capability. Re. your mention of landfills, I assume you’re referring to the F-111’s. What was the official reason/excuse given for consigning the 23 concerned to such a fate? Wouldn’t have even scrapping them if nothing else have been a better option? My understanding is that as they were built to deliver nuclear weapons the US demanded that they be destroyed at ‘end of life’, hence their destruction as landfill. BobS, not really. If that were the case they wouldn’t have been allowed to release six airframes to non-Defence museums. The main reason they were buried was because of the high levels of asbestos and other toxic materials used in the airframes which were deemed to costly and dangerous to remove as part of the scrapping process. It was thought better to remove those components which were still useable or of interest, e.g. capsules, some avionics etc, and then bury the rest. Am not necessarily saying it was the right thing to do, just that was the rationale. I think the fact that about 14 of the 43 F-111s we operated have been preserved in museums or as gate guards is a pretty good ratio overall.